So it looks like they're sticking with the cast from last season. I was hoping that they might bring Marc Warren back (and possibly Jaime Murray) as the Danny/Mickey rivalry was often entertaining (Hustle hasn't been the same since season series 3, but that could be a writing problem that would have happened anyway). It's not clear to me yet whether DCI Lucy Britford will be a regular character. It's also not clear if Robert Glenister will have a relatively small role this series (Robert is the brother of Philip Glenister, best known for his role as DCI Gene Hunt - perhaps the DCI will move forward a couple of decades to appear in Hustle? ), he's the only actor to have appeared in every episode of Hustle. Yes, the 29p version at Amazon does count towards the UK single chart (it seems Amazon are making an 11p loss with each sale!). It appears that you can even buy it more than once if you go through the checkout again (although I didn't actually buy it again). Or you can buy both versions, like I have, which should still count as two separate digital downloads. 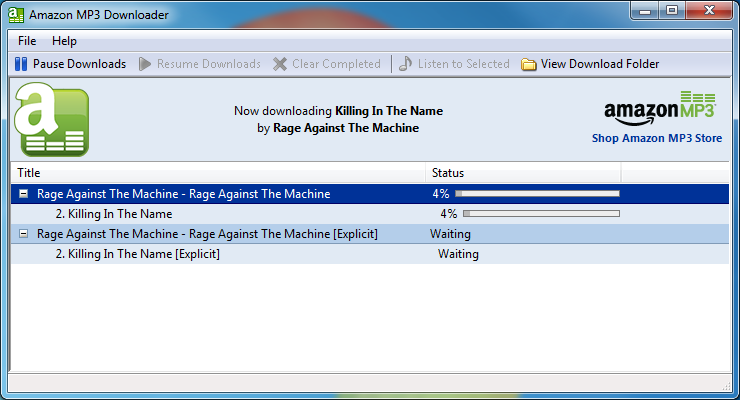 Also, the Amazon MP3 Downloader appears to work okay on Windows 7 (although I'd be surprised if it didn't). I have to wait ages until I can officially receive Freeview in HD. But as I watch BBC iPlayer's HD episodes I wonder if it'll arrive after the horse has bolted. The main benefit of Freeview would be that I can record it to watch more than 7 days later, assuming they don't add DRM. The quality won't be as good as BluRay so perhaps I'll put up with the internet and buy it in 1080p for posterity. Because we're not all pirates and I'll happily pay a fair price for something I appreciate.